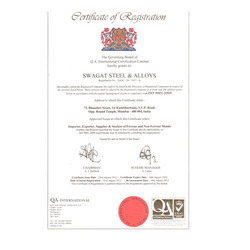 Incepted in the year 1985, we, Swagat Steel & Alloys, have made a well-recognized name as an importer, exporter, supplier, trader and stockist of ferrous and non-ferrous metal pipes & tubes, pipe fittings & sheets, flanges, steel flanges, steel fittings and various other metal products. Over the years of our operation, we have registered consistent growth rate under the insightful guidance of our mentor Mr. Nirmal Jain. Registration Certificate. to view this kindly see the image. We deal in comprehensive range of high quality steel products such as steel fittings, steel flanges, etc, that are extensively acknowledged for impeccable performance in various industrial applications. We take utmost care towards offering qualitative, durable industrial supplies to meet the requirement of diverse industries. Hence, we strive to procure only high quality products for each category of our range of products strictly from reliable vendors in order to successfully meet the requirements of our valued clients. The qualities of our industrial supplies remain same throughout the working life of any of the products after installation at the customers’ site. Being made from superior quality stainless steel, nickel alloys, copper alloys and other raw material these are capable to deliver peak performance. We have nurtured a team of Professionals who have facilitated consistent growth rate over the years of our trading activities. These professionals have years of industry exposure and therefore they form the backbone of our organization strengthening our business network. Our procurement experts and technicians work in close coordination in order to source superior quality and technologically improved pipe, tubes, flanges and various other products from the renowned vendors. Furthermore, our material expert and quality inspectors check each category of industrial supplies for their performance and endurance. In order to meet client's expectations, we always lay emphasis on gathering information in detail as per their requirements. Our procurement experts strive to source requisite industrial supplies from vendors in order to meet client's expectations. The specifications for each category of ferrous and non-ferrous products as detailed to our clients are taken into consideration and we strive hard to serve our clients to meet their expectation level. We serve our clients with ethics of better quality & service and therefore take utmost care in sourcing only high quality products. Apart from this, we have appointed apt quality inspectors who undertake various quality checks on a number of parameters that ultimately ensure required qualitative features of the products. All these activities are done strictly in accordance with the expectations of the clients that finally assure to receive total client satisfaction. We have developed an affluent vendor base over the years from the inception of our organization and maintained cordial relationships with them. Our vendor base comprises of many of the prominent names who are acknowledged as dedicated, reliable and dependable supplier of high quality pipes & tubes, flanges, fittings and other metal products that we deal in. These vendors are well known for providing superior quality industrial supplies and incorporate only high grade raw material in order to fabricate only high performing products. Further, our marketing representatives remain in constant touch with these vendors in order to continuously update our information on their activities. This enables us to understand their position and bridge the gap between the markets we cater to and the source of supply that ultimately facilitate smoothness in supply of the products that we offer. Apart from this, they take quick action on procuring exact product range as soon as we receive supply order from our clients. We are in constant touch with the representatives of the aforementioned industries along with many other that help us in understanding their requirements. This further helps us in proceeding in a manner, which gathers customers’ delights by fulfilling their needs on time.